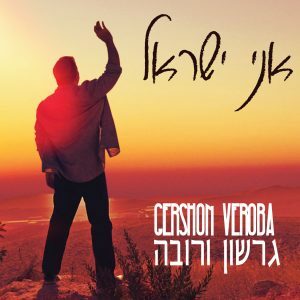 Today I’ll be reviewing Gershon Veroba’s latest album “Ani Yisrael”. There’s no doubt that you all already know of Gershon, whether from listening to Variations, Impressions, or his work throughout the Moshe Yess Tribute album. While we’ve been waiting a nice while for a new release, the wait is finally over, so let’s get started! Shimcha – Composed by Simcha Kranczer, this track starts off the album. You can hear from the first vocal note from Gershon that he’s still got it! Gershon’s vocals cut through the music perfectly and sit right in front with just the right amount of power. The arrangement has a 3 part shidduch of broadway, funk, and the ever popular disco. The instrumental solos towards the end from the organ and trombone take this track to a whole new level. Bayom Hahu – This next track, also composed by Simcha Kranczer, features Ari Goldwag. The combination of voices is not one I would typically think of singing together, but Gershon and Ari’s vocals complement each other perfectly! Ani Yisrael – What would a Jewish album be without a composition by Elie Schwab? It’s a good thing we don’t have to find out because this next track is composed by him. Started off in a ragtime-y style and, with the scratch of vinyl, you are transported back in time, until the sound of brass makes its way into the track and completely transforms the arrangement. Kim’at – I know I’m only 4 songs into this review but so far the arrangements have been outstanding and each one is completely different from the others. The diversity of the arrangements on this album are refreshing. This track was also composed by Simcha Kranczer. Mivon Siach – For those feeling down at this point due to the lack of compositions by Gershon on this album, get ready: this track, composed by Gershon himself, is a beautiful ballad. After listening to it there’s no doubt that Gershon will be fielding many requests to sing this at chupas. Let Me Be – While the last track was a treat, this next one is also written by Gershon. This track speaks from the heart and really represents the thoughts of Jews living in Israel who have to constantly hear how the land is not rightfully theirs. Gershon does an amazing job of giving over the powerful message of the song. Ki Chilatzta – This track is another soulful ballad composed by Simcha Kranczer. Rabi Nachman Omer – The collaborations are not over! This next track composed by Ari Goldwag features vocals by Micha Gamerman, perfect vocal for this fun track. You will no doubt find yourself tapping your feet to the beat throughout this track. Im Eshkocheich – When releasing an album centered around Eretz Yisrael, it seems only right that there be an “Im Eshkacheich” on the album. This one, composed by Ari Goldwag, is the perfect composition to match the words. Gad Elbaz also makes a vocal appearance on this track. While many are familiar with Gad’s upbeat songs, you will be blown away by his vocals throughout this ballad. Libi – This album takes us out on a middle eastern note. The final track on this album was composed by Elie Schwab and features vocalist Elikam Buta. While Elikam is the real deal when it comes to Middle Eastern vocals, Gershon holds his own perfectly throughout this track. All in all Gershon has released another album that will get added to his quite large list of musical accomplishments. The arrangements are top notch and the vocals are awesome! Definitely pick up your copy today.